Get the beers in, because the wait is almost over. European powerhouses Portugal and Spain, (current European champions and former World champions), kick-off their 2018 World Cup campaign later today when they step out onto Russia’s National Stadium in front of 80,000 fans at 7pm. And while we’ve gathered our bets on which team is most likely to come out on top, we thought it only appropriate to judge both parties off the pitch, too. So without further ado, we bring you the battle of the fittest – we’re talking cuisines, coastlines and…churros! When it comes to sweet treats, as a nation we’re spoilt for choice – so picking up the dessert menu is a given when we go abroad. Both Portugal and Spain are known for their delectable Mediterranean cuisine, with their crumbly pastries, pies and puddings being a popular shopping-basket staple. But which is best? Portugal’s Pastéis de Nata (custard tart, to you and I) is one of the most popular picks in the bakery, with a rich egg-custard filling topped with fresh, crispy pastry and a sprinkle of cinnamon and sugar. You’ll find this authentic pud in practically every bakery, deli, and coffee shops in Portugal – but we have Lisbon to thank for the original. Spain’s sweet contribution is none other than the famous Churro. These sugary fried sticks of dough (basically a straight doughnut) are traditionally dunked into warm chocolate sauce, and enjoyed as a heavenly midday snack or a tasty after-dinner dessert. If you’re feeling really indulgent, you can even pick up a portion after a night on the town with many shops still open in the late hours. Who does it better? Portugal – While churro’s make for a cheerful treat, the sweet, gooey centre and flaky top of a Pastéis de Nata is hard to beat in our eyes (and tummies…). It’s hard to choose between two of Europe’s most visited regions, especially when both players boast gorgeous beaches, vibrant owns and friendly resorts just a short distance from the UK – but we’ll give it a go. The Algarve is by far the most popular resort in the country. Home to one of the best coastlines in Europe, a mixture of cosmopolitan towns and traditional fishing villages, not to mention the award-winning golf courses, this part of Portugal has been a hot pick for as long as we can remember. All-round resort Albufeira is the largest in the area, serving up Blue Flag beaches, a lively strip, and a cobbled old town dotted with al fresco restaurants, shops and bars, while Lagos is all about laid-back days and life after dark. There’s a Costa del Sol holiday to suit all sun-seekers, with a list of resorts serving up everything from glitz and glam to history and culture. Marbella, Puerto Banus, Estepona and Benalmadena are ideal for those after an upmarket getaway, while Mijas, Calahonda and Torremolinos are all about golden beaches, authentic whitewashed towns and tatsy local food – making you feel like you’re visiting a home away from home. Who does it better? 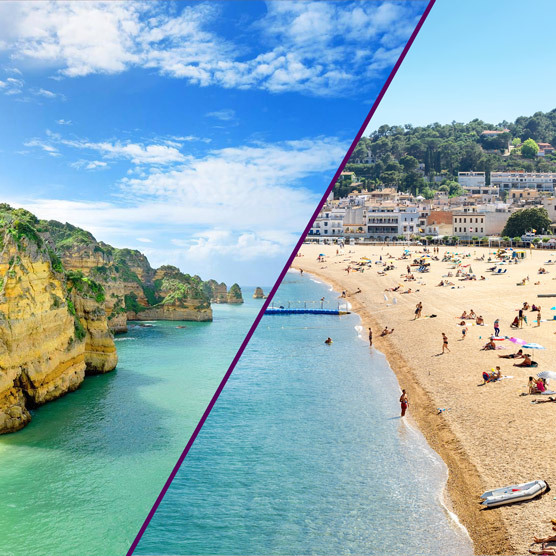 Portugal – While Costa del Sol has the variety factor, the Algarve wins hands down for its quality of beach resorts, inviting towns and gorgeous landscapes – a classy and comfortable destination worth visiting all-year-round. Port, a fortified wine produced in the Douro Valley, set in the northern provinces of Portugal, is a warming short traditionally paired with cheese – it can be enjoyed as a dessert wine or an after dinner tipple. This sophisticated wine comes in a variety of styles and flavours, from light berry fruits to rich woody tones, making it a versatile beverage great for complimenting a nice meal. There are endless Port Houses and Wine Tours to embark on in Porto, the country’s second-largest city, so take time out to do some tasting while you’re visiting. Spanish Sherry Wine (Vinos de Jerez) first originated from what’s known as the “Sherry Triangle”, three sunny cities - Jerez de la Frontera, El Puerto de Santa Maria, and Sanlucar de Barrameda – that when placed on a map, form a triangle. This fortified wine is somewhat undervalued; it’s versatile and diverse in flavour, however two predominant types you’re likely to see on shelves are Fino (straw-like colour, very dry with a light body) and Oloroso (dark in colour, dry, yet much richer in flavour). Ideally, light and dry Sherry like Fino is treated like a dry white wine and pairs gorgeously with tapas - think anchovies, prawns, ibérico ham etc. Who does it better? Spain – We didn’t think tapas could get any better, but pair it with a dry glass of Sherry and you’ve got yourself a winner. One of the highlights from the World Cup group stage draw was seeing Portugal and Spain pitted against one another in Group B - and on a more personal level the mouth-watering dual between two of footballs most controversial, but unquestionably talented players. For Portugal is Mr five times World Player of the Year, Cristiano Ronaldo. He may be 33 years old now, but on his day he is still able to win a match single handily, plus he is a huge reason why Portugal go into the World Cup as reigning European Champions. Despite his undoubted talent, he’s very much a Marmite figure, you either love him or hate him, so you’ll probably have your mind made up on what side of the fence you sit already. If you thought Ronaldo was a devise figure then you haven’t heard of Spain’s talisman, Sergio Ramos. While Ramos is one of the best defenders in world football, the fact he has amassed 22 red cards for real Madrid in his career means any collision with the sulky figure of Ronaldo is sure to create fireworks. Who does it better? Portugal - While Ramos has undoubted quality, for sheer X-Factor entertainment it’s hard to take you eyes off the almost super-human, Ronaldo. While you might not be able to tell the beaches apart, the difference between Portugal and Spain’s waters is crystal clear. The Atlantic is a playground for watersports lovers, its chillier temperatures and choppy waves makes it a popular choice for surfers and thrill-seekers alike. The west coast is one of the best stretches for activities, with beaches including Praia Amado and Arrifana great spots for surf schools, while in the north you’ve got Odeceixe – a beautiful village and beach often recommended by locals. Winter is the best time to visit the Algarve if donning a wetsuit is your favourite way of relaxing, when winds are strong and temperatures are around 16℃. On the other hand, the calm, tranquil, warm waters of the Med are a major draw for Spanish tourists, especially since it boasts the longest stretch of coastline in the Mediterranean (over 1,600km). The southern coast, including popular resorts Andalusia, Valencia and Catalonia, are a few of the warmest regions, ideal for a summer beach holiday. Who does it better? Portugal – While nothing says R&R like floating leisurely in the bath-like Mediterranean, the splash-tastic Atlantic Ocean is winning us over when it comes down to fun-factor. Grab your flippers and go! Both vibrant, exciting cities in heart of Europe’s tourist scene, Lisbon and Barcelona are hot spots for couples, friends and families after a short haul city escape. Lisbon holds the crown for being the oldest city in Western Europe, so it’s certainly got history in the bag. But the capital of Portugal is also loved for its great-value, rich culture, delicious cuisine and rustic cobbled streets – where rooftop bars rub shoulders with grand cathedrals. And when you have sandy beaches less than a 30-minute drive away, what more could you want? Sintra is a must-visit while here, bursting withstand-out architecture, enchanting sculpted gardens and hidden gems to explore. In the city centre, Belem Tower and Castelo de Sao Jorge are attractions to tick off. Barcelona’s atmospheric streets hum with life. There are endless things to see and do in this Catalonian capital, from admiring the unique architecture and modern art in world-famous Guell Park, to discovering the cities best tapas joints and expansive food markets (we’re looking at you Boqueria Market), and making the most of the eclectic nightlife, whether you wander entertainment-hub La Ramblas or seek out a local salsa dancing spot. Barceloneta Beach makes this city a top choice if you want the best of both worlds, with sun-kissed sands by day and super-charged city life by night. Who does it better? Both – We simply can’t choose between these captivating capitals, and luckily, neither do you! Our great-value deals on European city breaks means you can visit both players without spending a fortune – now that’s what we call a score! Check out our fabulous deals today. Beautiful Lagos, Algarve, Portugal on the left and castle in Tossa de Mar, Costa Brava, Spain on the right.